Because of the storm's proximity to the coast, high winds, rainfall, and flooding will potentially affect electricity infrastructure such as power transmission and distribution lines. Thousands of customers are already without power. Although there are no petroleum refineries or natural gas processing plants along the East Coast from Florida to Maryland, some product terminals could be affected, potentially reducing energy imports. Governors in Florida, North Carolina, South Carolina, and Georgia have declared states of emergency in advance of the storm's arrival. 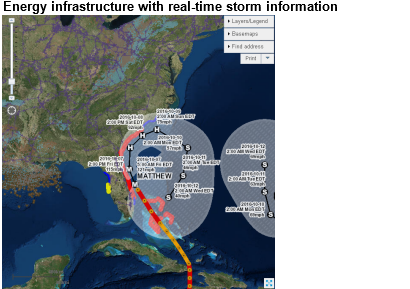 EIA's energy disruptions map displays key layers of energy infrastructure, including oil refineries, power plants, and major electric transmission lines, and real-time storm information from the National Weather Service. The disruption map page also contains links to the U.S. Department of Energy's Emergency Situation Reports and other websites that provide updates on the effect of severe weather on energy infrastructure. GasBuddy, a retail gasoline price comparison site, maintains a crowd-sourced tracking tool to determine fuel availability at thousands of retail stations in the Southeast. 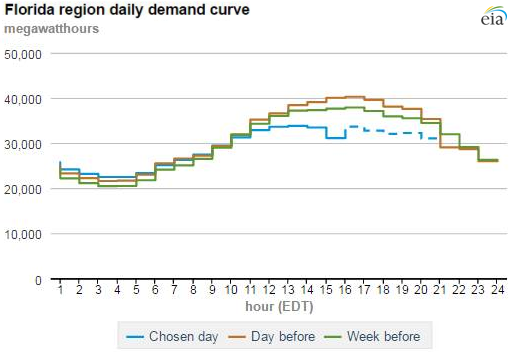 EIA's U.S. Electric System Operating Data tool provides near real-time information on electricity demand and can show areas where service has been disrupted. On Thursday, electricity demand in parts of Florida was lower than forecast as the weather worsened and customers evacuated the area.